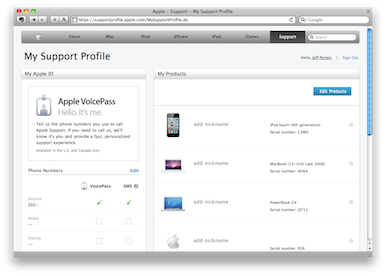 Getting technical support for your Apple products has become a bit easier with the introduction of the new Apple Support Profile Website. This site provides one-stop shopping for you to check the registration and warranty status of all of your Apple products. If you have a repair or support issue in progress, you can review Apple’s records about the issue right from your Web browser. Apple also has an option called VoicePass for US and Canadian customers, which promises to match your profile to your phone numbers so they’ll have your computer information at their fingertips when you call from that number. Presumably they could have done this without asking permission, but it’s a nice touch allowing you to update which numbers they keep for you. American customers also have the option of receiving text messages with status updates. Even if you’re not currently troubleshooting a Mac or iOS device, this is information that is useful to have in one place, both for you and for Apple, when it comes time to call the Support line.